Arsenal will next month face Napoli in the UEFA Europa League quarter finals and they will be hoping to beat this Italian side because it’s one of the favourites to win this match. Arsenal has got drawn with Napoli in the UEFA Europa League quarter finals and it is going to be an interesting tie because these two clubs are both among the favourites to win this competition this year. 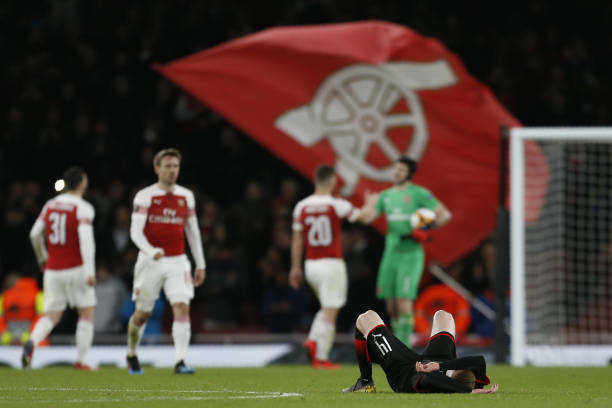 The gunners will however be disappointed that the first leg will be played at the Emirates Stadium because they would have felt better if they played against Napoli away from home in the first match. Arsenal was originally supposed to play Napoli away from home in the first leg but the sequence of the Europa League quarter finals draw saw Chelsea play the second leg against Slavia Prague at home in the second leg so UEFA changed the tie because two London clubs can’t have European matches on the same day, so the local authorities requested to change the fixtures if the draw saw this happen. The North Londoners will be hoping to see their players put on an incredible performance because they will need to beat some of the big guns if they want to win the UEFA Europa League this season. They will be hoping that Arsenal doesn’t make the same mistake that it did in its semi final tie with Atletico Madrid last season.